South Africa’s Special Economic Zones have attracted over R16.8 billion in investments, says Trade and Industry Minister Rob Davies. Speaking at the first National Special Economic Zones (SEZs) Investment Conference on Wednesday, Davies said the total number of operational investors in designated SEZs has now reached 115 with a private investment value of over R16.8 billion. “Since the introduction of the new SEZ legislation in 2014, the number of designated zones has increased, the investor confidence has improved, the number of operational investments has increased and continue to increase. “Support from various sectors of the society, in particular, all spheres of government, State-Owned Entities (SOEs), the business community and labour has also improved considerably,” he said at the start of the two-day conference. The Minister said the companies have created 15 716 direct jobs. The Dube TradePort Special Economic Zone has managed to attract 35 operational investors with an investment value of R1.5 billion, creating a total of 3 246 direct jobs. In the 2017/18 financial year 429 new direct jobs and 974 construction jobs were created. As at 18 March 2019, 184 new direct jobs and a total of 2 020 construction jobs have been created. According to Davies, Coega SEZ has become a best practice model for all SEZs in South Africa and across the continent, and it remains the biggest SEZ in terms of number and value of investments on the African continent. “In 2012, the Coega Special Economic Zone had 19 investors with a total private sector investment value of R1.13 billion, creating 3 778 jobs. As at April 2019, the Coega SEZ has grown to 43 operational investors worth over R9.93 billion worth of private investments. As a result, it has doubled its direct employment creation to 8210 jobs and 19402 including construction jobs since inception,” said Davies. Davies said this was an indication that the SEZ Programme in South Africa was on the correct path. To improve and upscale the impact of the SEZ programme, Davies said it was critical to look at new and innovative ways of supporting SEZs to achieve more and double investments in line with President Cyril Ramaphosa’s mission to attract more investments to the zones. Davies said it was time to find tailor-made solutions that will support the SEZs and find solutions that will support investors in the zones. MEC for Economic Development, Tourism and Environmental Affairs in KwaZulu-Natal, Sihle Zikalala, applauded government for implementing the SEZ programme particularly the two SEZs in KZN which he said have become the catalyst for foreign direct investments. He added that community members living in far flung areas that were neglected by the apartheid regime are already benefiting from the investments in these economic zones. 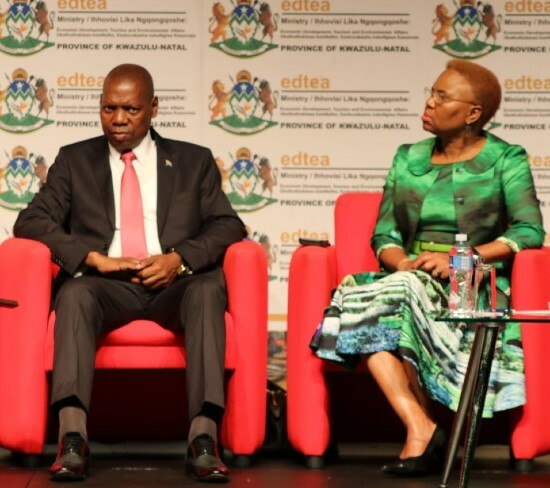 The two-day conference at the Inkosi Albert Luthuli International Convention Centre in Durban, is hosted by the Department of Trade and Industry, in partnership with the KwaZulu-Natal Department of Economic Development, Tourism and Environmental Affairs (EDTEA).